Tempered chocolate is nice and shiny. Learning how to temper chocolate isn't as hard as it looks. A lot of people think that the tempering process is difficult and complicated, but really, all you need to do is pay attention and you'll have great results. 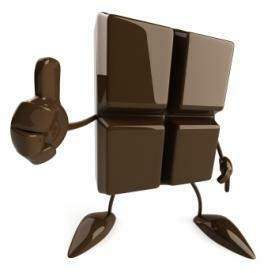 Do you know how chocolate has that nice, shiny surface and a characteristic snap when you break a piece off? This is all because of tempering. Chocolate is full of little crystals, and there is one particular kind that you want to form: beta crystals. Once you've got the proper kind of crystals formed in your chocolate, you'll have a nice, shiny bar of chocolate that looks like you're used to seeing in the grocery store. It's important to know, though, that chocolate can easily lose its temper - no joke - if it's reheated. This will cause all of the beta crystals to melt, which in turn causes your chocolate to look dull and cloudy. It may even form a white layer over the surface, which is actually fine - this is simply cocoa butter rising to the surface. It's completely edible if this happens. One thing to note is that chocolate falls out of temper at about 90°F, so if you have chocolate that is already tempered and you don't want to re-temper it, make sure that it stays cooler than 90°F. 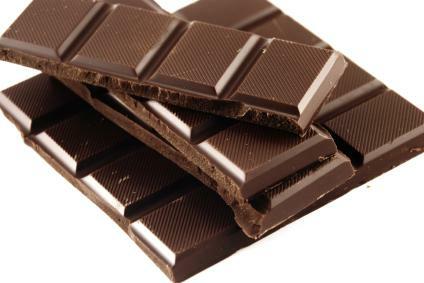 Anything warmer than that, such as a hot kitchen or a closed-up car, will cause your chocolate to go cloudy and soft. Tempering chocolate isn't so hard! So, how do you go about tempering chocolate? There are some very complicated ways to go about tempering chocolate, but there are also simple ways. First off, you need an accurate chocolate thermometer, which will tell you exactly when the chocolate has been successfully tempered. After you've built up some experience tempering chocolate you may be able to tell instinctively when it's done, but for now a thermometer is a good thing to have. Melt your chocolate in a double boiler, bringing it to a temperature of 115°F. Let the chocolate cool until it is between 82°F and 84°F. Place a piece of already tempered chocolate into the pot so that it can help start the creation of crystals. Now bring the chocolate back up to about 89°F so that the beta crystals will form. Fish out the chunk of chocolate that you'd plunked in there and do whatever you like with your chocolate. It can be molded, formed, used for dipping, or whatever else you like! Cooking for Engineers has a great article on tempering chocolate, for those of you with a more scientific mind. This article talks all about the technical side of tempering chocolate, if you want to know the inner workings! Cookbook author David Lebovitz has a great tutorial on how to temper chocolate at home. His method is particularly easy. There's even a video that shows you how to temper and melt your own chocolate in the microwave!